At the same event where Engadget saw the Google TV displayed, Engadget also got a chance to get a quick hands-on with the T-Mobile G2, sibling to the HTC Desire Z announced earlier this month. While we have already seen a hands-on for the Desire Z, this is the first time we had a decent hands-on done for the TMobile G2. As for the differences between the Desire Z and G2, the difference seems to be the amount of onboard storage (4GB on the G2, 1.5GB on Desire Z) and the lack of HTC Sense on the G2. Everything else appears to be the same based on what we have seen so far. Performance-wise, the phone runs Android 2.2, and is very quick, with Engadget commenting that they didn't notice "any real lag" when using apps and browsing the internet. 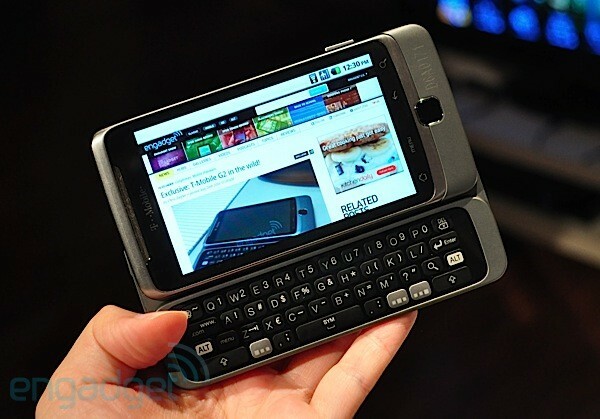 Engadget remarks that the Z-hinge QWERTY keyboard "feels very robust and springs right open." It was also commented that the spacing for the keys seems right, but "seemed right" for typing. As for the decision behind only 4 rows instead of 5, Engadget didn't comment, but I also didn't see any attempts to use the keys in the video. I can say that I would not like to use function every time I needed to input a number. Check out the video here. AndroidPIT may be getting a version of the handset (likely the Desire Z) in the future for testing, and if so, we will have our own in-depth impression of the handset as well for our readers.